This is not an application, but the cell phone network information lumia which can in appropriate settings of your mobile phone capabilities Lumia. To open the default, could you try with dialing ' ## 3282 # '. Finish typing the sign #, automatically you will Redirectly to field test. Poll frequncy (second), UMTS Band, network Type, Limit SMS Storage, Toggle ENS (reboot requirment), Toggle CMAS RMT (reboot requirment). You are on the website page WINDOWS MOBILE PHONE - setting and Upgrade. Field test With the link URL http://hand-uk.blogspot.com/2015/07/field-test.html for this articles, you can bookmark or share to any. Our expectation that Windows smart phone users, can understand and know about OS Windows phone. 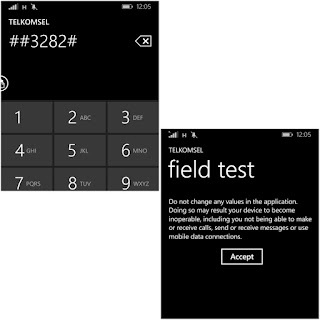 Field test Is a link for you, How to use the pure smart phone.